What am I talking about? Well, I could be talking about the way the Yankees have been playing the past few games, to be sure, especially with the way the flu bug has hit the team…but I’m not…I’m talking about John Flaherty. I told you that he’d be in this weekend, and that during his last trip to the studio, he not only fell off his dietary wagon….he fell off a dietary cliff! 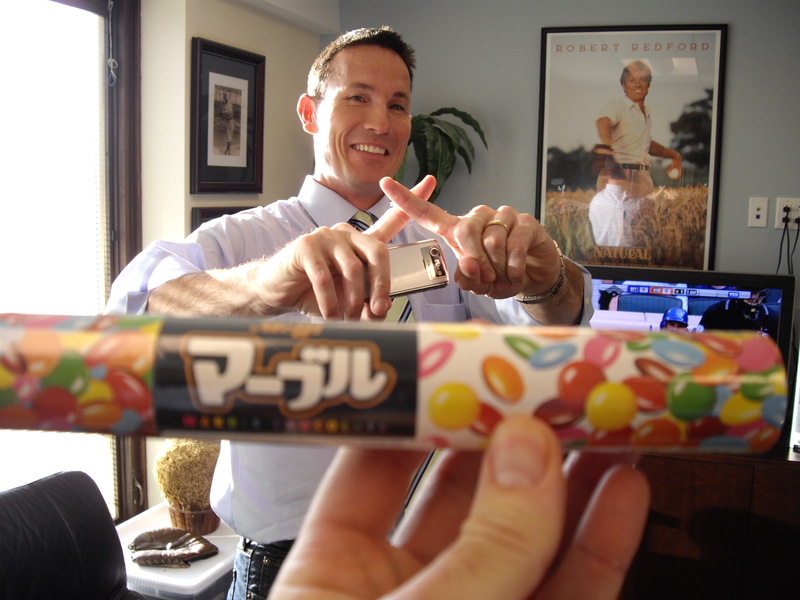 His 3-day stint began with him bringing healthy dinner from home…however, by the end, he’d ravaged his body with copious handfuls of M&M’s! But this time, Flash has stuck with his game plan…no M&M’s…no foray anywhere near the lil’ bowls of goodness that are on my coffee table. 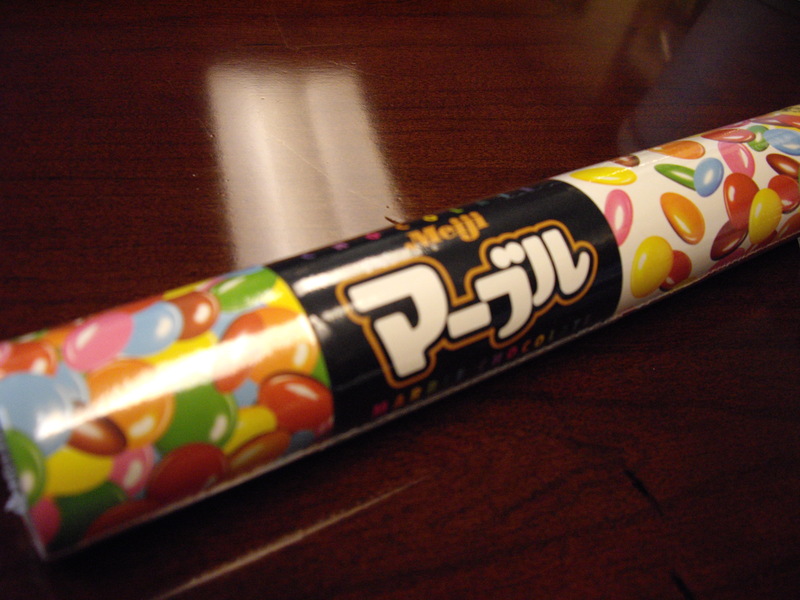 I even thought that a new KIND of M&M, from Japan (kindly supplied to The Blob by promotions guru John Brueckner) would tempt Flash to once again enjoy the goodness. 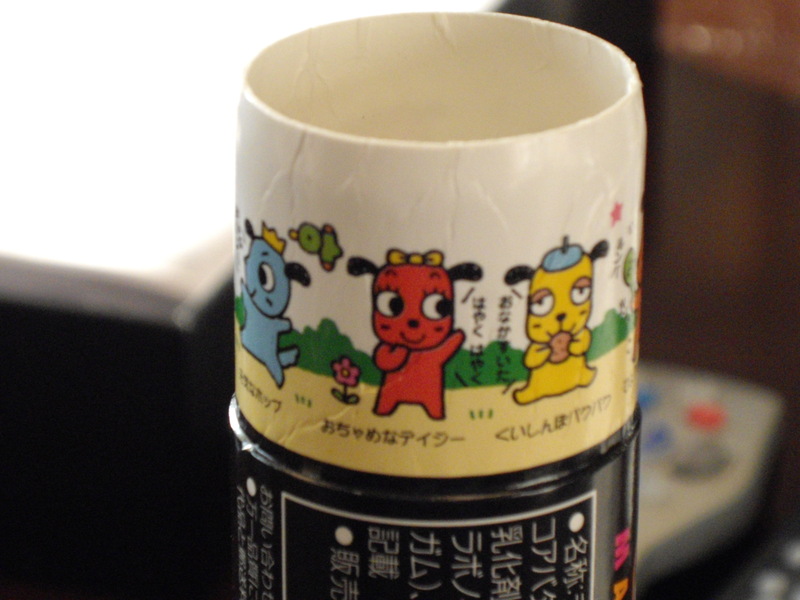 But as you’ll see from the pictures below, he has stuck to his guns…impressive on one hand, incredibly boring on the other…I mean, look at the cuteness on the top of the tube when you take off the lid! How can you not be sucked in by that?! Instead, he stuck with his tomato and mozzarella salad…boy, that huge smile on his face sure shows how much he loves eatin’ all healthy…C’mon Flash…read this and dig in! Lifer (so far): Chris is a YES Network original, plucked from the NFL Sunday Ticket studio, which was run out of here, by our own Supervising Producer Woody Freiman. 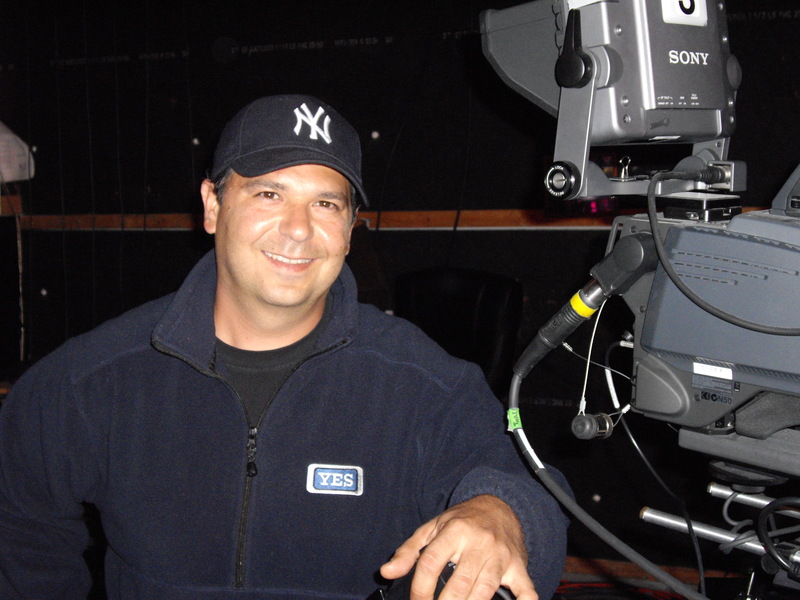 His entire career encompasses studio camera work, field ENG (electronic news gathering) and work as a lighting director. Note the weights on the handles of his close-up shot. Those are about 250 lbs. 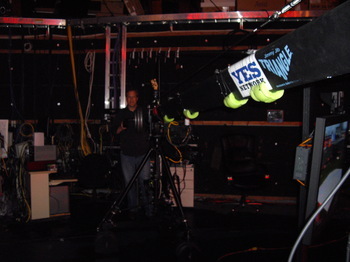 of counterweights to offset the camera and arm on his jib camera…and he has to wrangle with that about 300 or more times a year. Which Leads Me To… What Chris likes to do in his free time. He’s at the gym nearly every morning, throwing around the iron, surely in part to move the jib around so deftly…Chris is a man’s man, so he ain’t doing any Jazzercise classes when he gets to the gym! He also likes home improvement projects (working on a new deck and firepit combo), photography, hiking, fishing, hunting and hitting the open road on his 2004 Harley Davidson Fat Boy…Chris knew he was going to get one when that model debuted in 1999, and lo and behold, 5 years later he dropped the dime and put one in his garage. You Went Where?! Chris has traveled the world for his work and seen a lot…all over Europe, Central America, the pyramids and Sphinx in Egypt…even Africa, where he covered the Sudan Civil War. I asked Chris if his life was ever in danger, and he said once…he was in southern Sudan with the People’s Liberation Army, and they encountered incoming shell fire from government forces…I had a similar life-or-death experience…I tripped on a microphone cable at the ballpark and nearly fell head-first into a dugout! Good Grief, Looper! Glad to have you back home! “We Italians have a saying…’We only drink wine twice a day. With our meals, and without our meals.’ ” CLASSIC. It’s so good that I’m gonna try to use a modified form of that and apply it to my Czech heritage. Food Finale I gave Chris no choice…one meal for the rest of your life…he picked pasta with his mother’s sauce (red sauce, homemade…she’s Italian, fer cryin’ out loud!…meat sauce). As for the catered food here, he said…”anything Italian”…what’d ya expect?! Pork rinds?! Incomplete Resume Chris has piloted glider planes, so cross that off the list…but he says he would like to direct some documentaries and maybe an independent film. As for his life resume, he says he’s still looking for Mrs. Right…but while that search continues, he’s also looking for Mrs. Right Now…not kidding…he said it with a glint in his eye. That’s Chris for ya…or should I say…Mr. Big? 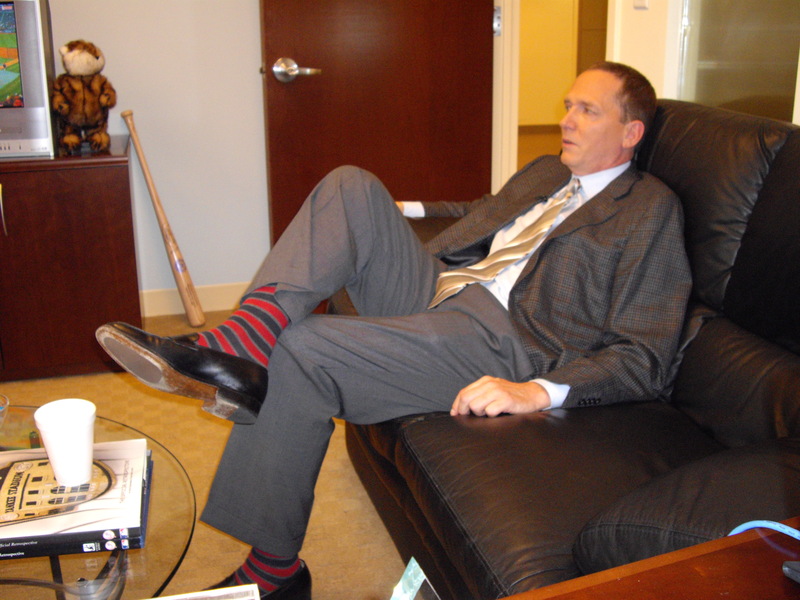 Do You Love The Socks? 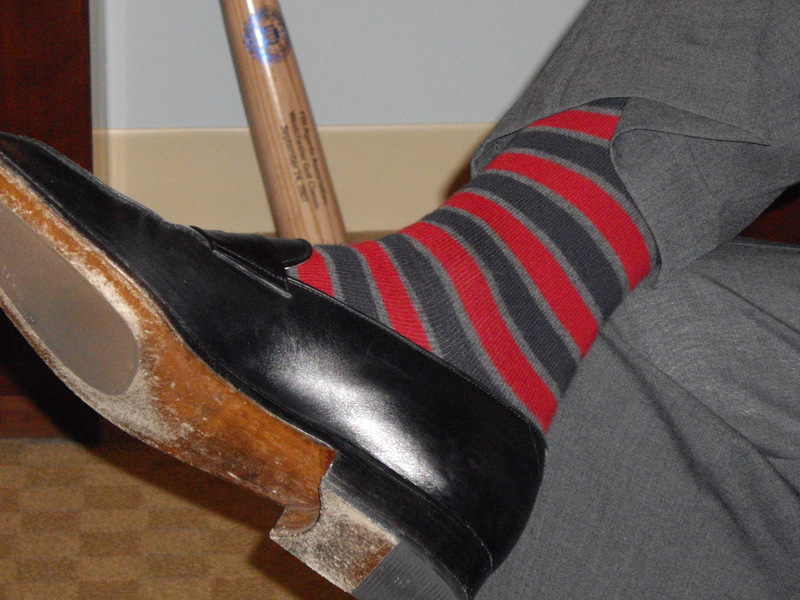 NOOOOOOOO, not THOSE sox!….The socks that David Cone wore to the studio tonight! Coney’s 3-year-old son picked ’em out for him to wear….he LOVES ’em! So David loves ’em, too, and proudly wore them in…I think he’s making a bold fashion statement…And what do Mr. Blackwell and Cojo say?….WHO CARES! 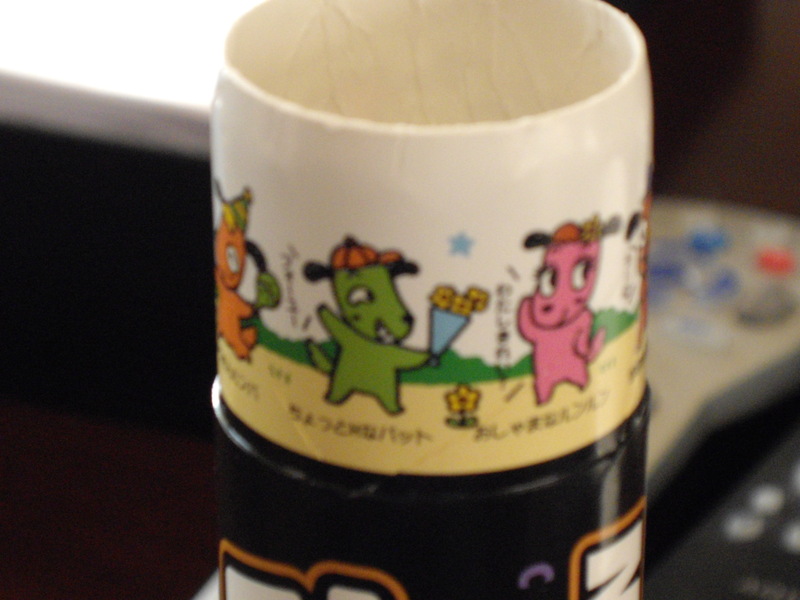 They’re awesome. HOW IS THAT POSSIBLE ???!!!!!! And yes, there are still M&M’s left…though, I have to say, between dinner and me going upstairs to do the 4th inning cut-in and then returning to my office, the M&M peanut bowl went from 2/3 full to empty! It wasn’t just Coney, though…there are several others who enjoy throwin’ em down as well! 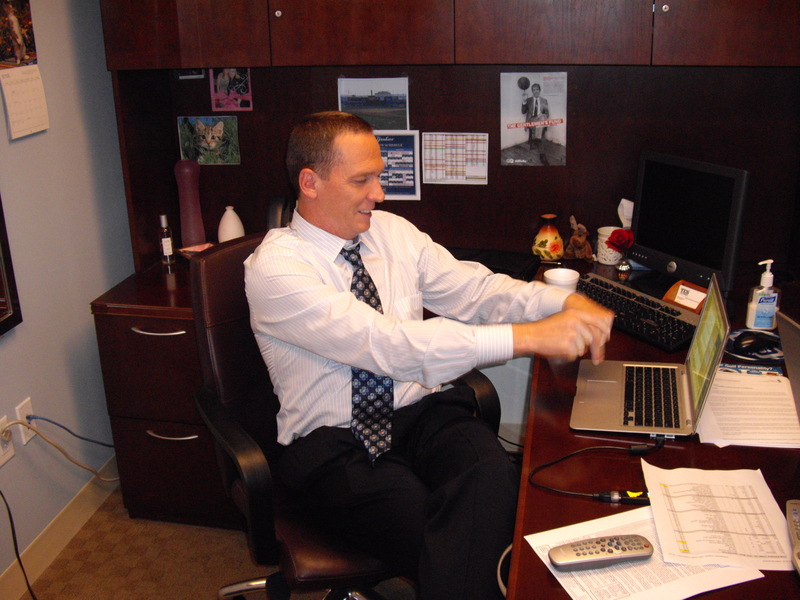 No, really, it is alive!…OK, it’s actually a live chat with David Cone, going on right now…and I have the pictures…. That’s Coney on the left, furiously typing answers to your questions…and that’s internet guru Kevin Sullivan on the right…the guy who’s REALLY typing the answers! Basically, as many of you who are far more internet savvy than me know, Kevin asks David questions from you, and then types in his response. The answers are all Cone, with K-Sull workin’ the keypad. Trust me, it works better that way. Because Kevin types pretty fast…Coney, I believe, is…well…he’s a great pitcher and not quite as highly ranked in the world of typing! BTW, did you catch the answer he gave me on the chat? Review the chat and look for “Bob in the Office”…that was me…and now we all know what Coney enjoys doing in the wee hours of the mornin’. Also, as he mentioned, Coney went with Chicken Piccata tonight, while I…after consuming 37 pounds of food at lunch…went light…arugula salad with grilled chicken and raspberry vinagrette dressing…oh, no…don’t look now, but there’s a bowl of peanut M&M’s staring at me like the stack of Geico money! controlling the world in the next few years…. Favorite Teams: Baseball (check the cap), NFL: Giants (he shares season tix on 50-yd line or, as Paul refers to them, “seats from God”), NBA: Da Bulls! Paul is married to the far lovelier Melissa and they have 3 boys…triplets!…Jake, Luke and Paul…which is why Melissa is dubbed “the Saint”…They are 9 years old and playing Little League ball right now…Paul coaches as much as he can given his schedule…he says he plans to pencil in Luke (LH) at 1B and Jake (LH) at SS this week, while Paul (RH) is slated to pitch. 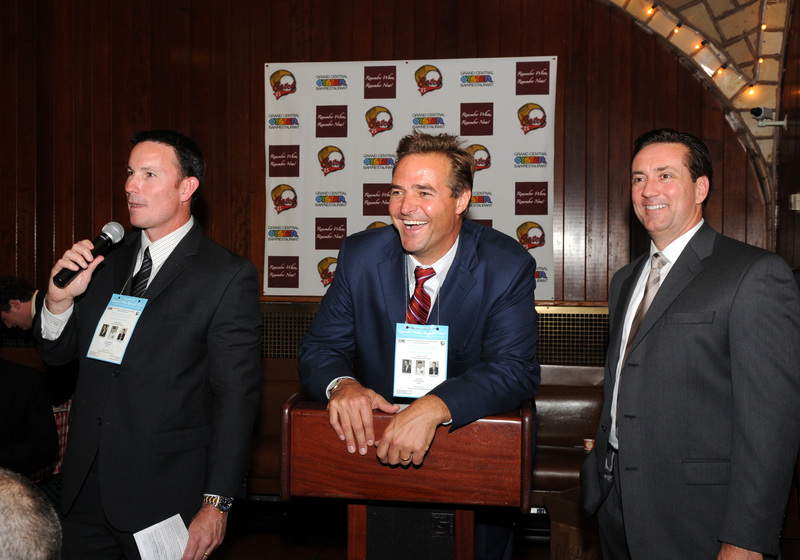 By the way, all 3 pitch…a righty and 2 southpaws…gotta be a gold mine in there somewhere, eh, Paulie?! As far as the job goes, Paul’s been at YES the entire 7+ seasons of existence. 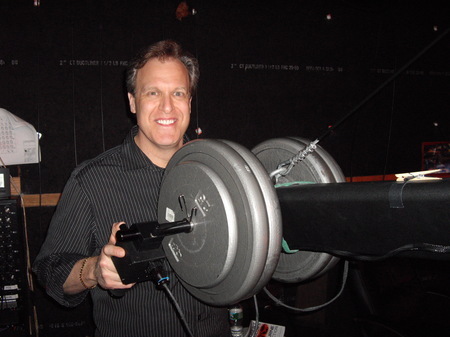 Prior gigs include stints at News12 and Martha Stewart…went to electrical school, but didn’t see himself doing electrical work for 40 years, so picked up an internship in local TV…says the best part of the job is watching his favorite baseball team every night on a 12-foot HD projection TV, while the worst part is “working pro baseball hours without the same pay as the pro baseball players.”…But Paulie, being the reasonable sort, has his feelings (and stomach) occasionally soothed by the food that’s catered in from time to time…Favorite?…Penne Alla Vodka with chicken from Spazzio’s. Finally, career hilight to date for Paulie?…Attending the final game at the old Yankee Stadium…he worked one of the cameras we used on the 3rd base side of the field for the pre- and postgame shows….Funny….I would have bet top dollar that Paul’s career hilight was getting mocked yelled at by me for throwing my gum away just before we pre-taped a segment a couple months ago (I previously Blobbed about this)….Hmmm, maybe he forgot that. Two final notes: Perhaps you noticed his last name, “Ferrigno”….Yes, he is related to the Incredible Hulk, Lou Ferrigno…3rd or 4th cousin, Paul says…he’s not sure. I’m guessin’ they don’t text each other much. And, I’ve seen Paulie grow from AT BEST a rudimentary ping pong player into one of the toughest outs in the building…he’s worked hard at his craft, Man…Oh, wait…his craft is cameraman, not pro ping pong player! Alright, he’s great on the camera, too! 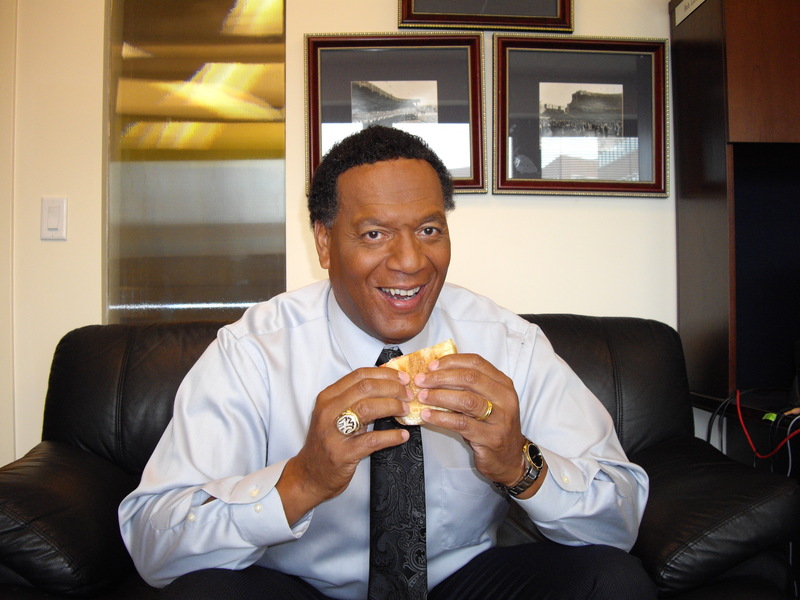 Final game of three between the Yankees and Rangers…and the final game of three in studio for Ken Singleton, who’s heading back home to Maryland after the postgame show…but before he leaves, let’s see if I can accommodate all you Blobbers out there who can’t get enough of Singy. First, someone wanted to see Kenny eating in my office…interesting, but true…so below, enjoy Kenny enjoying a delicious prosciutto, mozzarella and tomato sandwich for lunch! Also notice in the picture, the ring on his right hand…I threw a pop quiz the other night, tied to Mrs. Singy’s blog, about which of the three championship rings Ken possesses that he’s been wearing during his three-game in-studio stint….the answer? The Yankees’ 1999 World Series ring that they gave to him as a team announcer. And now, the candy question…someone wondered which bowl Kenny dips into when he’s enjoying a post-meal dessert…the answer? The M&M with peanuts bowl…but very sparingly…he eats them individually and not by the handful…obviously knowing that they do, from time to time, melt in your hand before they melt in your mouth. On a related note, I just killed five Reeses mini peanut butter cups…three regular, two high-octane white chocolate…. Oh yeah, some of you may have heard during the game broadcasts either Tuesday or Wednesday about Kenny and I playing golf together two days in a row, with our supervising producer Woody Freiman (who may or may not have been there, depending on whether or not he was skipping meetings to play…I will never confirm nor deny his presence! )…Well, final hole yesterday, Kenny’s looking at 210 yards uphill…pulls a 4-iron out of the bag…pures it… can’t see the final result, though, because of the hill and a small swale in front of the green… we get up there and his ball is about a foot and a half from the hole…tap in for birdie. That’s Kenny for ya…right on the money! 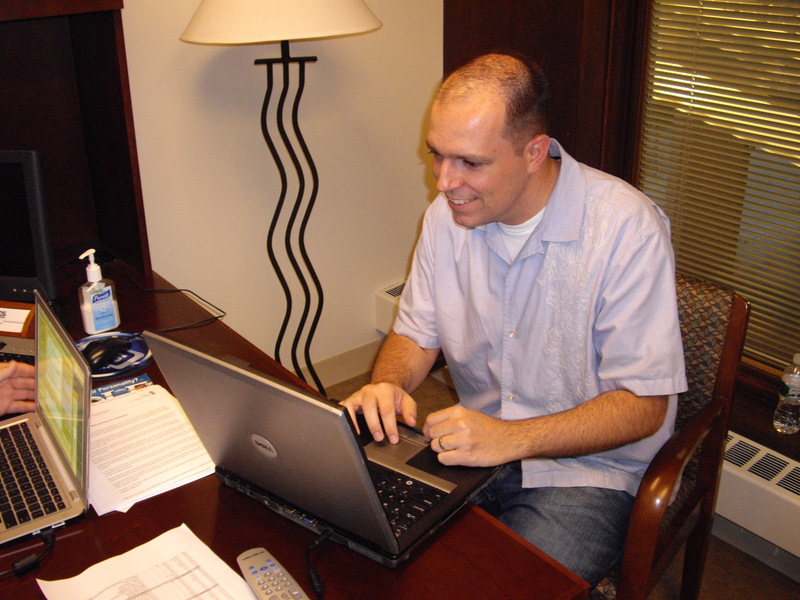 When you stop by here at YESNetwork.com, I hope you get the chance to read all of the great blogs that are being written. 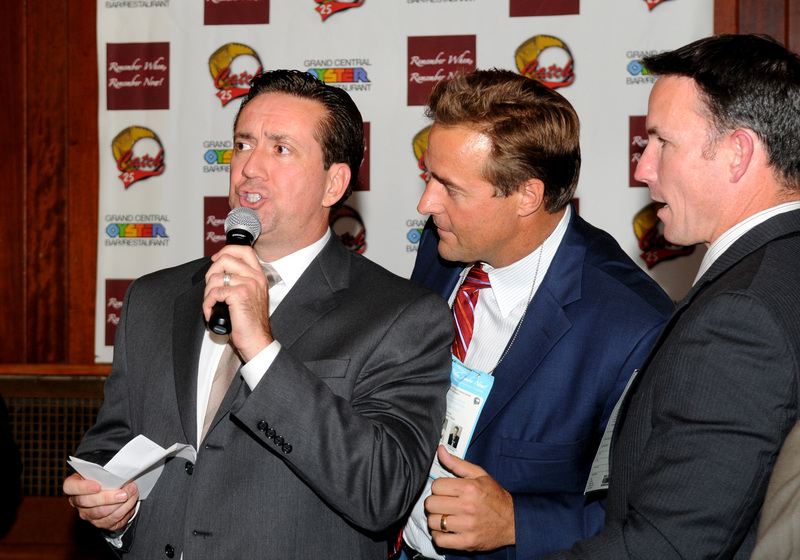 It’s a big endeavor by a lot of people who have a passion for writing…and for baseball. I think just about everybody knows about Kim Jones’ background as a writer, for example. And writing has been an integral part of all my jobs…starting with getting a degree in broadcast journalism at USC, to my first TV job in Eureka, Calif. (I was the one and only sports person at the station)…to my next stop in West Palm Beach (weekend sports guy, had to write all my own stuff)…to CNN and Turner Sports (yup, wrote almost all of my stuff there, too…and now, to The Blob. (By the way, there’s a little tip in there for all the young pups thinking about going to journalism school…write, write, write). And by now, you’ve noticed the title of this Blob, The Singy Ringy Thingy. Check out the blog of Suzanne Singleton, aka Ken’s wife, aka “Mrs. Singy” here on the Web site. She has a tremendous background as a writer and author, but what you might particularly like in one of her latest blogs is her detailed description of the three championship rings that Ken possesses. Click on her blog, check out the bling, and then try to figure out WHICH ring Kenny is wearing tonight on his right hand on the postgame. Between looking for that and looking for the old guy in different hats in Cleveland, The Blob has evolved into some weird internet version of Where’s Waldo?! 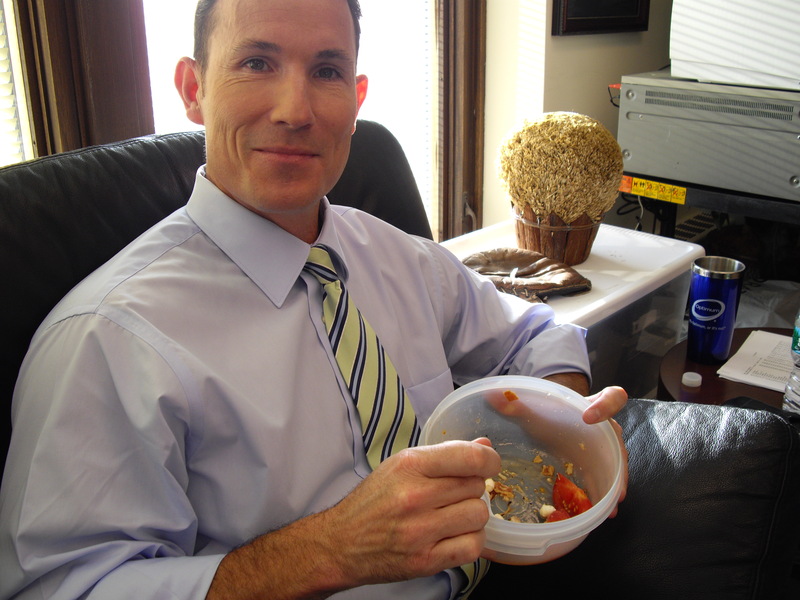 I received a request to take pictures in my office of Kenny and me enjoying our dinner. Well, he’s here for the entire Rangers series, so I’ll check with him and see if he’ll allow that kind of personal access (because it is personal when one is sitting there eating lasagna with a huge string of melted cheese hanging off one’s chin. That was not Kenny, by the way, that was me). I hope Flash reads this because then he’ll know he missed out on Spazzio’s lasagna. Sorry, bro. In the meantime, here are a couple things in my office I thought might amuse you. 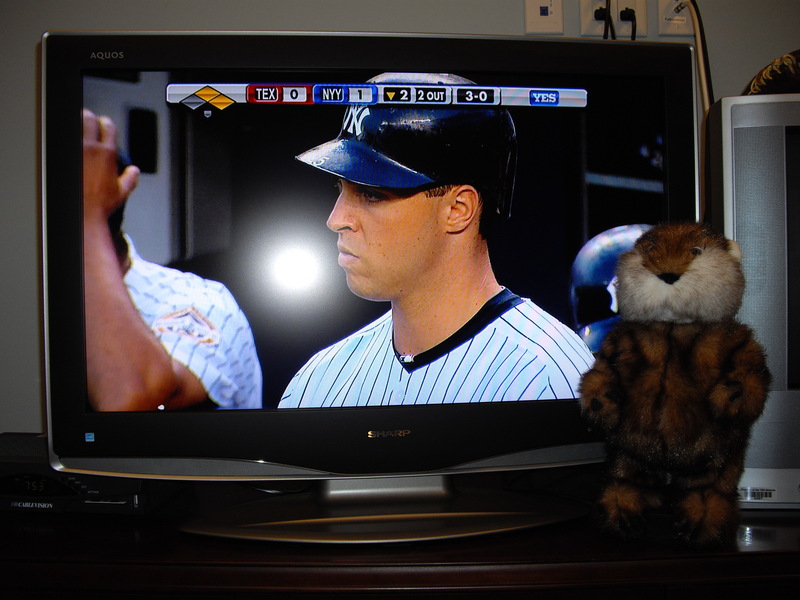 The first picture is the TV we watch the game on…and yes, that is the Caddyshack Gopher making a cameo. The second picture is a drawing my daughter did a few years back that I display proudly…I guess you could say it’s something of an inspiration. 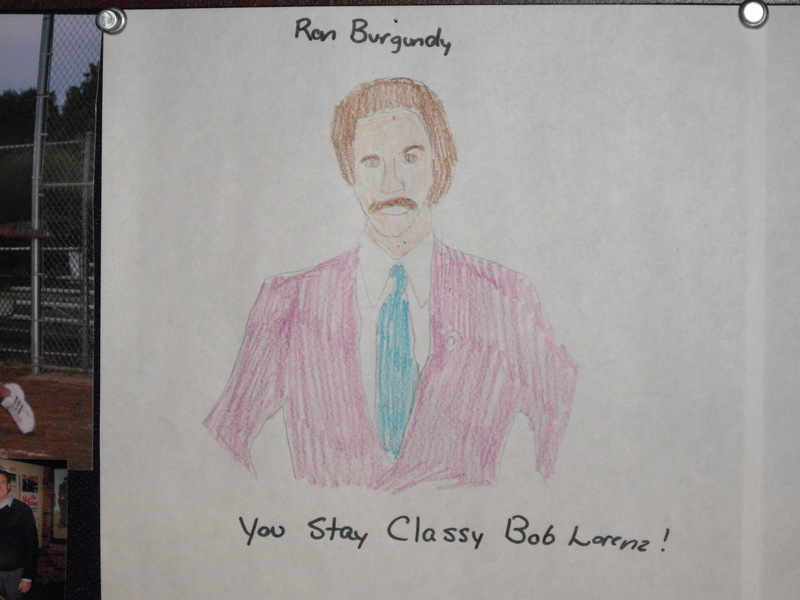 I mean, how can Ron Burgundy NOT be inspiring to an anchorman? !